Queen Dragon. Freight quote required, delivery by lift gate truck! The SilverFire Queen Dragon is an ornate cast iron combination wood or biomass burning cook & heat stove with firebox below and a plancha / griddle plate with in-set direct heat boiling / frying cutout in a larger footprint than the Princess Dragon. Primary and Secondary hot flu gas combustion means efficiently burned wood, smoke and exhaust, when using quality, dry fuel. Reduce your cooking and heating bills and live green by utilizing renewable fuels. Large firebox and ash bin means easy maintenance. 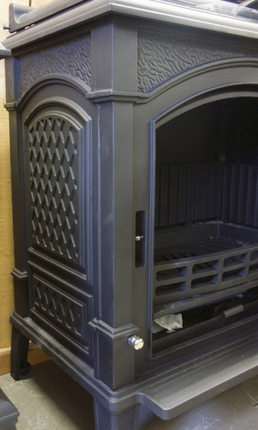 Firebox features rugged cast iron double wall hot flu gas construction. Maximum combustion burn times are going to vary typically from 7 to 15 hours, depending on load volume, species, moisture content, and density of fuel. Simply flip the hinged protective cast iron grate top on top of the stove to vertical position to access the elegant cooktop below! Crepes, pancakes, tortillas, sear meat vegetables and other delicious food, or remove the direct heat cut-out for boiling, frying, woking, or other higher firepower cooking applications. Maximum Heat Output: 51,000 BTU / HR / 15 KW. Estimated heating capacity: 1,000 - 2,400 sq. ft. 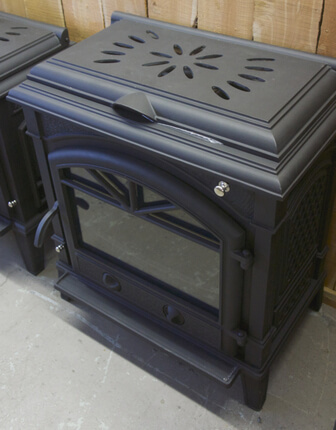 The heavy duty cast iron stove has double wall hot flu gas construction with replaceable cast iron firebox components (including rear wall, side wall and grates for long stove life) designed in a finned wall motif. This is a primary air gasifier, with hot flu gas channels designed through out stove. This is a very clean burning stove when using appropriate dry fuel. 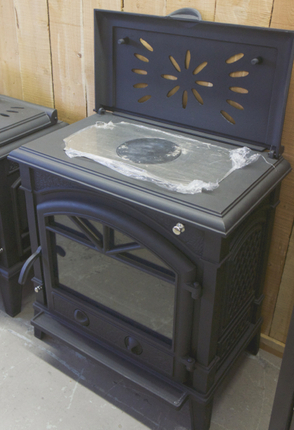 Primarily designed as a cook stove, this stove doubles as a heat source in your home, cabin or other living space. She has a big sister (next listing) and interesting combination cooking & heating relatives too, see the Princess Dragon, Tabletop Dragon and Dragon Baker (under Oven listings!). This stove has dual primary air dampeners below the firebox grate and an additional hot flu gas dampener above the firebox. The fine ash clean out drawer is found below the firebox and easily accessed by opening cast iron / glass firebox door. The 6" chimney fitting is housed in rear of stove for easy installation to customer's preference. Pallet shipping quote & delivery by LTL Freight required. Secondary hot flu gas combust at top of firebox, maintain efficient rolling flames and keep firebox door glass clean. This secondary combustion ensures efficient, clean burning performance. Primary ventilation dampener allows easy wood burning ignition and the secondary airflow dampener above controls comfort. 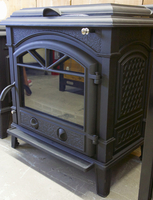 The goal of a well designed clean burning cook stove is to burn cleanly as possible, reducing emissions and fuel use. The secondary combustion above the flame is also known as gasification. All SilverFire stoves provide both primary and secondary combustion, to maximize combustion efficiency and protect the environment.